Adventures in Everything: Adventures in New Orleans! I've wanted to go to New Orleans for almost as long as I can remember. Well, as long as I can remember jazz at the least. This trip was a dream come true... in so very many ways. our dinner on the balcony. Once we arrived in good ol' NOLA,we settled into our hotel and set off to Bourbon Street. As soon as the cabby pulled up, people were singing and dancing in the streets to a local street band jammin'. Just past the band, the street was as alive as I would have expected it to be: people walking around with their go cups, laughing and carrying on; merry-makers throwing beads off of balconies, and music pouring from every corner of every room, from every window and door. Music enveloped you. And it wasn't just any kind of music -- not just jazz or dixieland.... there was rock, R&B, jazz, dixieland, hip hop, even country music rang out from one open door. We made our way up and down Bourbon before deciding on dinner. Our first dinner in the quarter: Alligator Sausage Po'Boy! We walked around a little and found some sweet jazz music coming out of the Maison Bourbon. We hung outside of the door as the band was swinging inside. A girl could not have asked for more. I went back to the hotel with a smile in my heart, just for having arrived. The next day we decided to take the St. Charles Street Car over to the French Quarter. We walked around and explored all that the French Quarter had to offer. 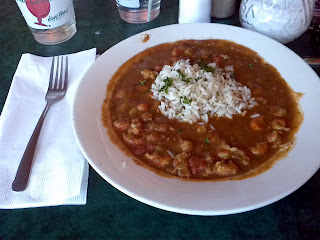 Getting hungry and just a little thirsty, we headed to Pat O'Brien's for a world famous Hurricane, some jambalaya and a little crawfish étouffée. Jamil Sharif at the Maison Bourbon. After sampling some local Creole Praline (don't say pray-leen, it's praw-leen!) we eventually made our way down toward the river, walking along Ol' Man River and enjoying the sites. That night we decided to head back to the Maison Bourbon for a peaceful evening of delicious libations and sweet jazz. Some of our favorite songs of the evening were: Baby, Won't You Please Come Home, Ain't She Sweet, Tiger Rag and I Like 'Em Fat Like That. Café au lait and beignets at the Café du Monde. You can't really top that, so we decided to do a little more exploring. We walked down by the Mississippi River and decided to take the ferry across the river to check out Mardi Gras World. We walked down the 'Jazz Walk of Fame' and straight over to the giant warehouses only to learn that Mardi GrasWorld had been moved across the river. So, being leisurely, we rode the ferry back and took a shuttle to Mardi Gras World. There we learned all the ins and outs of building world famous Mardi Gras floats, as well as sampling a little King Cake. Later that night we headed back over to the French Quarter to enjoy the band at Preservation Hall. The band was phenomenal. I personally loved the bass solos by the sousaphone player, but all of the musicians were top notch. Some of our favorite selections of the evening included Up The Lazy River, Why Don't You Go Down to New Orleans, Ice Cream, and of course Tiger Rag. Tuesday we decided to book a swamp tour. I wanted to see me some 'gators! Of course, we had been warned by a very friendly couple that the animals were not lurking about and we might only see some hibernating swamp trees. But we decided it would be worth it to go anyway. Dr. Wagner's Honey Island Swamp Tour was very, very cool. Our tour guide, Captain Charlie, was extremely knowledgeable and well spoken. Despite the fact that most of the swamp was dormant, it really was quite beautiful. Thanks to some remarkably fabulous weather, we were able to see a few critters: a woodpecker, two herons, a nutria, and lots and lots of turtles! Our trip would not have been complete without a 'gator siting, and I think ours was pretty awesome. Our last day in New Orleans was fabulous. We got up and took a ride on the St. Charles Street car from our hotel to the end of the line, passing by the beautiful houses in the Garden District. Next time, I hope to spend some quality time walking around and better enjoying the wonderful architecture. We rode back to the French Quarter, where we enjoyed a delicious Po'Boy and visited the remarkable St. Louis Cathedral (that is where Harry Connick, Jr. got married!) Having a little more time to kill before our flight, we explored the French Market and ended up at my new favorite place, the Cafe Du Monde. New Orleans has got to be one of the coolest places in the world.